Fifth grade students at Mary Morgan Elementary School in Byron hold up the KleenSlates through a grant from the Byron Foundation. 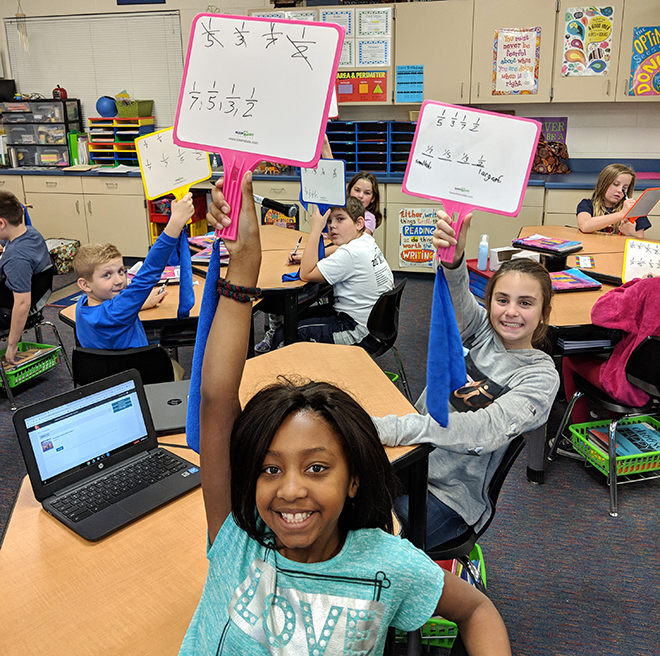 After attending a co-teaching conference, Mary Morgan Elementary 5th grade teachers, Mrs. Erin Mumma and Mrs. Patti Ludwig, realized the potential benefits of purchasing KleenSlate whiteboards. These double-sided ‘paddle’ boards have removable templates designed to aid students as they share their ideas. Each KleenSlate includes a microfiber cleaning cloth and a low odor marker attached to the handle of the paddle. The design allows each child to learn and write answers simultaneously in a group setting. Mumma and Ludwig applied for and received a Byron Foundation grant for their inclusion classrooms. KleenSlate templates are available for math, language arts, social studies and science. Teachers also have access to graphic organizers and mind maps which can be easily inserted into the plastic flaps. This saves valuable time for the teacher and allows the students to organize their thinking while working. “We started a math lesson using the Kleenslate boards and the students were so excited and engaged in the lesson. They were easily able to show their thinking and creativity. We are so fortunate to have whiteboards and templates during science while students work in large groups and they also transition easily to work together in small groups,” states Mumma. The Byron Foundation, 501c3 non-profit, established in 1993, is an independent organization, founded to provide the Byron School educators access and opportunity to impact learning that empowers students and provides an enriched education beyond the district tax dollars. This volunteer Team of parents, educators, and community members are committed to supporting children with unique experiences to help broaden their education, expose them to enriched opportunities and to cultivate leaders. We are a cohesive group of people with a mix of background and talent, with a shared vision. The Board of Directors meets every 4-6 weeks, host two annual fund-raisers, accept and process grants that average $5,000 a year, and manage scholarship funds for other individuals and organizations. Over the past 24-years, over 40 community members have served as board members, raising funds and granting over $104,000 to the Byron School staff for use in their classrooms. We recognize and celebrate the history and value of the Foundation’s work. The focus on long-term planning and sustainability has led to a recent partnership with Community Foundation of Northern Illinois and the creation of a new Byron Foundation Endowment Fund. The Byron Foundation Endowment Fund establishes a financial reserve, provides a reliable source of income in perpetuity and shows the solidity and permanence of The Byron Foundation in our community and our commitment to continued educational excellence in the Byron School District. If you are inspired to give of your time and talents or a tax-deductible gift to the Byron Foundation Endowment Fund, please contact Byron Foundation President, Michelle Albert: malbert6@comcast.net or 815-985-5102.